- Prices in Euro's, excl. 21% VAT. 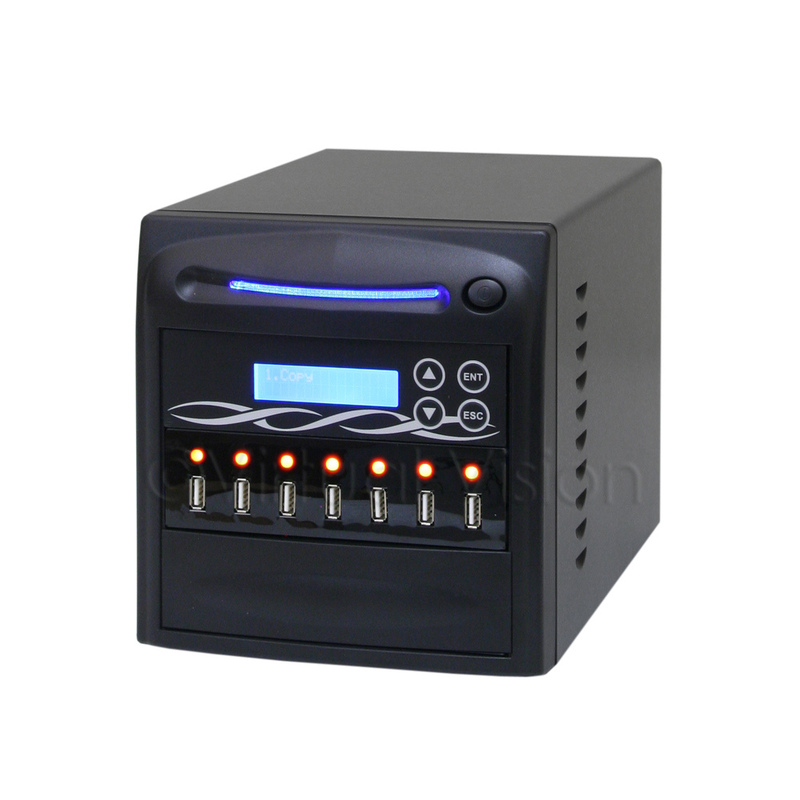 The CopyBox 6 USB duplicator is perfect for users who regularly need to duplicate USB flash memory sticks. The system operates completely stand-alone, without software or PC connection. The CopyBox 6 USB can simultaneously duplicate 6 USB sticks (USB 1.1, 2.0 and 3.0) from one "master" stick. Just insert the master USB stick into the master data port, insert empty USB sticks in the target data ports and press the button! The CopyBox USB supports both sychronous and asynchronous duplication. Asynchronous duplication allows sticks to be switched continuously once they have finished copying. When duplicating small data quantities, asynchronous duplication will save you time. The CopyBox 6 USB offers a maximum duplication speed of 33 MB/s, per individual port. This allows a data throughput of 118 GB per hour, per port. However, most current USB sticks offer lower writing speeds which makes the CopyBox production capacity dependant on the specific USB flash memory used. - Stand-alone operation, easy to follow menu. - Synchronous and Asynchronous duplication. - Suitable for all users, no computer knowledge required. - One master data port and 6 target data ports. - Maximum copy speed 33 MB/s, per port. - Compatible with USB 1.1, 2.0 and 3.0 flash memory sticks. - Format, Erase, Media Check en Capacity Check functions. - Also suitable for memory cards (using USB memory card adapters). - Easy operation through a LCD display and control buttons. - 100% reliable copies due to the integrated control functions. - Also available as 13, 20, 27, 34, 41, 55, 69 or 83 USB port models.